Egge holds a BA in Philosophy and a PhD in Elementary Particle Physics (i.e. tiny tiny particles). Egge van der Poel searched for (and found…) the Higgs particle at the Large Hadron Collider of CERN, in Geneva. After his PhD at CERN he trained to be a Medical Physicist and was a Big Data consultant at KPMG before taking on the newly created function of Clinical Data Scientist at the Erasmus Medical Centre in Rotterdam. In addition he advices many organisations about Big Data, teaches courses on it at various academic institutions and is an experienced public speaker on the subject of Big Data. 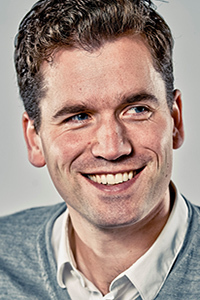 He coordinates executive education programs at TIAS Business School (www.tias.edu) and at the Jheronimus Academy of Data Science (www.jads.nl). How Data Science is creating inequality in Healthcare. And why that’s a good thing. In this lecture Egge will demonstrate what we can learn from Physics (e.g. the discovery of cosmic microwave background and the discovery of the Higgs particle) and from toddlers… He will share his experience creating value (knowledge and/or euro’s) from data, using examples from his work as a Data Scientist in profit and non-profit sectors. With some remarkable examples from the clinical practice of the Erasmus Medical Centre he clearly shows that Big Data can quickly lead to tangible added value. He will also address his vision how to overcome the shortage of relevant talent. Over the past 20 years her research focus has been on the development, evaluation and implementation of innovative eMental-Health interventions for common mental disorders from prevention to treatment. The scope of her current research activities includes the use of mobile health, and combined online and face to face (‘blended’) treatments for depression, anxiety and substance use related disorders. New methodological challenges include the development and evaluation of mobile ecological momentary assessments and interventions (EMA/EMI), patient-centered design and predictive modeling. She has opted for an international perspective and collaboration throughout her academic career and acted as Principal Investigator of over 15 large scale European Union projects and reviewer for Research Funding Organizations globally. She was Principal Investigator/coordinator of the European Comparative Effectiveness study on Internet Interventions for Depression (E-COMPARED, www.e-compared.eu). She has published over 180 (international) peer reviewed papers and book chapters within the eMental-health domain. In 2013 Heleen Riper (co) founded the Journal of Internet Interventions of which she is associated editor (published by Elsevier) and in 2014 she became President of the International Society for Research on Internet Interventions (ISRII) for which she acts now as Past-President. 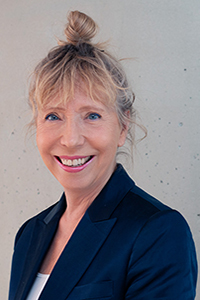 She is chair of the DIFFER EU-Consortium (Digitial Framework For E-health Research) which develops, evaluate and implement the digital MoodBuster 2.0 platform for mental disorders. Can ‘digitomics’ and digital phenotyping contribute to a personalized treatment approach of depression? Developments within (epi)genetics, neuroimaging and proteomics contribute to the development of a number of phenotypes of depression and thereby open the road to increased knowledge about the psychopathology and treatment of depression. Within a Personalised Medicine approach towards depression (PM-D) ‘omics’ such as genomics, epigenomics, and pharmacogenomics play an important role in improving diagnostic procedures and personalised clinical pathways. We assume that an ‘integrated omics’ approach (multiple ‘omics’ and their within and between interactions), instead of a ‘singular omics’ approach is a promising way forward. However, given the heterogeneous nature of depression and its manifestation in biological, behavioural and environmental features we assume that biological markers alone won’t be able to tailor diagnosis and treatment to individual patients or subgroup of patients. Therefore, we propose to integrate ‘digitomics’ as part of a personalised medicine approach as well. Digitomics defined as digitally obtained data both obtrusively and unobtrusive these may include mood monitoring, physical and geographical activities as well as online social media behaviour. These data may enfold depression expressions in situ as well as generate data from related everyday life experiences. These may enrich and correlate with biomarker signatures. Combined, these may mark distinct ‘integrated depression signatures of individuals and/or groups of patients and subsequently may predict successful treatment response or failure to do so in subgroup of patients. Thus, clinical symptoms are linked with biological and behavioural/environmental parameters. Digital phenotyping (also defined as ‘digital footprint’) is an additional option enabled by the use of digitomics which can be defined by the quantification of individual smartphone use (and other wearables) in daily life both measuring obtrusively and unobtrusively individual behavioural patterns. One of the potential advantages of digitomics is that these are relatively easily accessible on a large scale against low costs. Realising that this approach is still in its’ infancy Riper will present the conceptual framework surrounding the domain of ‘digitomics’ and explores what digitomics and digital phenotyping can contribute to a personalised psychotherapeutic approach of depression by means of a number of study results of the H2020 European Comparative Effectiveness Study on Internet-based Treatment of Depression (E-COMPARED).